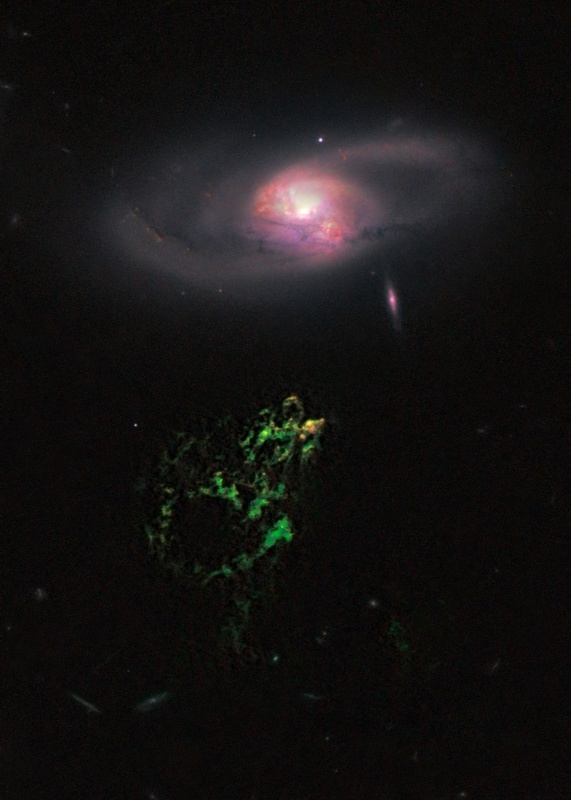 The green object in this photo is Hanny's Voorwerp, a galaxy-sized cloud of gas, possibly the remnants of a jet blasted out by a supermassive black hole. On Saturday, I reminded some people of my St. Patrick’s Day post from last year, but I was remiss. While there are no green stars, there are a number of very important and interesting green objects, many of which contain oxygen. One of these objects is Hanny’s Voorwerp, a galaxy-sized gas cloud discovered by Dutch schoolteacher Hanny van Arkel in 2007. Clicking on the picture at the right will take you to more information, but in brief: astronomers now think the Voorwerp (a Dutch word simply meaning “object”) may be what remains of a jet of gas blasted out by a supermassive black hole. I wrote about the physics of The Little Prince (more or less); Maria Konnikova just wrote a post about the psychology of the same book. She has a little more to go on than I do! Jacquelyn Gill asks an important question: How can scientists actively engage with the media? Speaking as someone who is both a scientist (albeit an unemployed one) and a freelance member of the media, I think these points are spot-on. I also think a lot more people would be interested in the kinds of research many scientists do…if they knew it was happening. Blogs can fill in a lot of gaps in public outreach. On a similar note, Matt Shipman asks whether reporters should read the actual scientific papers they cover in the media. I agree with most of what he says: the key to understanding a topic doesn’t necessarily lie in the research paper. Gauss knows, I’ve read a lot of very poorly-written scientific papers (and written a few myself, much to my personal shame). It’s a complex issue, however, and my own mind isn’t made up about it yet. In other words, you may be seeing a full post from me on the subject one day. “Quantum gravity” is a chimerical notion: while there is no actual quantum theory of gravity, we have some guesses about what one might look like. Specifically, many quantum gravity proposals include a fundamental length scale known as the Planck length, which would mess up things like the Heisenberg uncertainty principle. While the Planck length itself is far too tiny to probe in the foreseeable future, a group of researchers has proposed that modern quantum optics experiments might still be able to detect deviations from ordinary quantum mechanics due to quantum gravity. Energy storage right now is mostly confined to chemical batteries (whether nickel cadmium, lead-acid, lithium ion, or whatever). A possible new very cheap alternative is graphene-based capacitors, which are lightweight and flexible. Your future laptop may be a lot lighter! Condensed matter physics is the study of materials with relatively high density. In many of these materials, the electrons interact in really crazy ways, giving rise to something known as quasiparticles: collective behavior that acts like entirely new particles. A new set of experiments has allowed physicists to tune quasiparticle properties, making them act like relativistic fermions and simulating a wide variety of behaviors, like the Higgs field.